Staying active has benefits at every age. 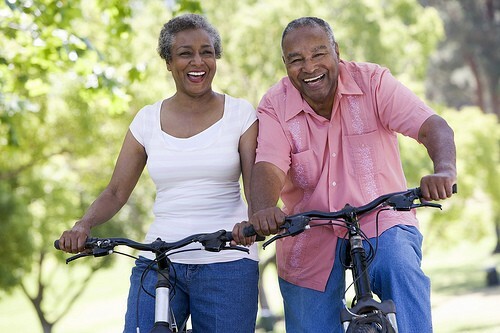 May 29 is National Senior Health & Fitness Day. Staying active has benefits at any age, and those with limited mobility or social opportunities may need help and encouragement to stay active. • Patient, positive persuasion has a higher rate of success than coercion. Reminding a loved one of exercise’s effects on health, well being and longevity often is the best approach. Family members, friends or caregivers might join in the activity to provide praise and encouragement. • Focusing on activities a loved one once enjoyed, then breaking them down into manageable goals, can prevent frustration. A senior who once loved brisk walking might start with a short walk down the block and back and work her way toward bigger goals. • It’s important to consult a physician before beginning any exercise program. A senior may be reluctant to discuss medical problems with family members for fear of loss of independence. The 20th annual National Senior Health & Fitness Day on May 29 is one of the nation’s largest health promotions for older adults. Recognizing the important of staying active, organized fitness events for older adults will take place at more than 1,000 locations, including senior centers, hospitals, parks, churches and other community locations. Visit FitnessDay.com for more information on National Senior Health & Fitness Day. Dianna Malkowski is a Board Certified Physician Assistant and Mayo Clinic trained nutritionist specializing in diabetes, cancer, wound healing, therapeutic diets and nutrition support. She serves on the board of professional advisors for The CareGiver Partnership and enjoys working with patients and caregivers alike. Ask Dianna a question, or call 1-800-985-1353 for Personalized Attention(SM) from a product specialist. Watch this video explaining our many caregiver resources.